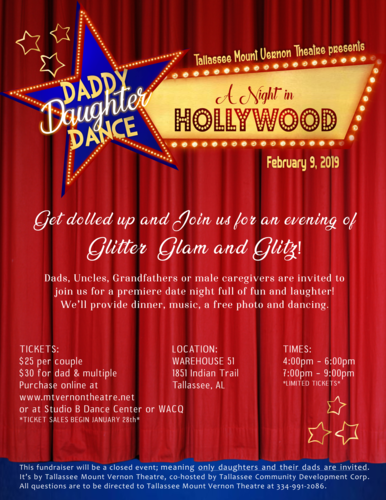 Get dolled up and Join us for an evening of Glitter, Glam and Glitz! Dads, Uncles, Grandfathers or male caregivers are invited to join us for a premiere date night full fun and laughter! We’ll provide dinner, music, a free photo, and dancing. 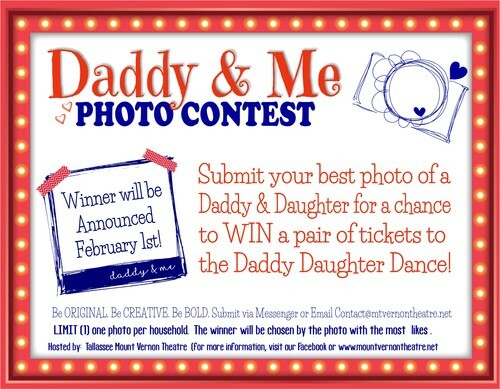 Ticket Sales Begin January 28th: $25 per couple $30 for dad & multiple Purchase online at www.mtvernontheatre.net or in person at Studio B Dance Center or WACQ. Times: 4:00pm - 6:00pm 7:00pm - 9:00pm *LIMITED TICKETS* This will be a closed event; meaning only daughters and their dads are invited. Sorry, no moms or brothers allowed. Tickets are limited for both sessions. This is a fundraiser for & hosted by Tallassee Mount Vernon Theatre, co-hosted by Tallassee Community Development Corporation. All questions are to be directed to Tallassee Mount Vernon Theatre at 334-991-2086 or their Facebook page. Tallassee is located in the Montgomery & Selma Region of South Alabama. Be sure to check out places to Go, Eat, Stay, and other events in Tallassee.